It happens to the best of us: you've worked hard to build a daily routine that lets you maximize every second of every day. You've mastered the fine art of working smarter, not harder, and everyone in the office is jealous of your productivity skills. Then, that upcoming business trip (or even vacation) gets slotted on the calendar and threatens to jeopardize everything you've built up to this point. Take a deep breath and relax. Staying as productive as humanly possible while on-the-go is a challenge, yes, but that doesn't mean it's impossible. If you want to make the best use of your time while you're out of the office, here are four simple, yet essential, tips you'll want to focus on. You know how it takes everyone a few days to recovery from the hour gained or lost due to Daylight Savings Time? Time zones are even worse for your productivity, especially if you're not a frequent traveler. If you're going to be headed across the country (or even across the world), the first thing you should do is update all of your devices to local time. You're the one out of the office, so the burden is on you to adapt, not everyone else. Most "smart" devices have a feature in the "Settings" application that will update to local time automatically as soon as you connect to your first Wi-Fi network once you arrive. If you're not already embracing the wonders of cloud-based storage services like Dropbox, now would be the time to start. Not only does it make sure that all of your documents sync to all of your devices, but many services (like Dropbox for Business) include built-in collaboration features that let multiple people edit the same documents at the same time. 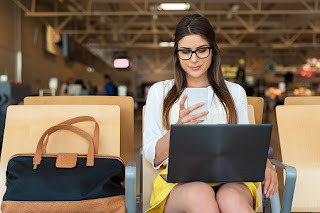 Whether you're on a business trip or are on vacation, if something needs to be approved or modified while you're waiting for your flight to take off, you'll still have the opportunity. Regardless of where you're headed, your instinct may be to take your daily routine, the one you worked so hard to build and hone, and cram it into a travel-shaped box. This is an instinct that you should fight at all costs. Don't pretend that nothing has changed just because you're going to be away from the office for a few days. That's how mistakes are made. Instead, think about the obligations you have on your trip and find opportunities to remain productive around those scheduled demands. You'll have a much better chance at building a new, temporary routine that works for the specifics of the situation you find yourself in. When you're hard at work in the office, you tend to have more time to pay attention to the little details of the task at hand. It's something that goes hand-in-hand with being a career-driven professional. The problem is that this is almost always a bad idea. Striving for perfection 100% of the time is a great way to get less done in a day than you need to.